Many of you have written to me, asking me for the next installment of the RoadTrip. Thank you so much for your continued interest and support: nothing can keep a writer writing like an enthusiastic audience. I promise I have not abandoned my plan to relate the RoadTrip stories, far from it. I’ve outlined essays for each of the days of the trip, and I’ll be posting them as I finish them. The blog hiatus was a necessary, productive one, although it did stretch longer than I’d hoped. The hiatus began because of my own version of writer’s block: I have a lot of stories to tell, and sometimes my mind races ahead through all of the details, too fast for the rest of me to keep up. And then I get locked up, because instead of having nothing to say, I have too much to say and either no idea how to say it, or worse, no idea how to organize it so that other sentient and/or literate beings can understand it. A major theme of the RoadTrip story is, of course, how bad I am at letting go of a plan, so it’s not inappropriate that I got locked up in the telling. In both my personal life and in my writing life, I have a discernable pattern of behavior when it comes to The Plan. In this case, I had The Plan of relating the RoadTrip story, one day at a time, but the essays were taking too long to write, and other, more current stories started piling up. It seemed important to tell the whole story in one narrative line, to not jump around chronologically, but this was frustrating: the newer stories seemed more fun to tell. So I jumped around in draft form, finished nothing and posted nothing, because I was sticking to The Plan. Eventually, I stopped writing essays that would have moved The Plan forward because I couldn’t admit to myself that it was no longer a good plan. I couldn’t let go of The Plan. Instead, and this is the good news, I worked on my novel, which, for better or worse, has no plan whatsoever, because I have no idea how to write a novel and it never even occurred to me to create a plan. There have been times when the chaos of this novel has made me want to Frisbee the laptop into the pool, but not enough, not yet, to make a plan. When I do make a plan, and I will make a plan, because, well, it’s what I do, I will need to remember to keep that plan a fluid, malleable thing. I spent the end of September and early October with the Little Brother and his family, helping them prepare for, welcome, and adjust to, Baby Brother. The adjustment was hardest for Big Sister Sophia, naturally. She’s only three (“ThreeInAugust,” as she would say), and even though her parents did as much as they could to prepare her for her new sibling, there is only so much she can understand. She is a sensitive, brave girl, and she will process everything on her own, in her own way, in her own time. But watching her struggle with all the new realities in her little world made my heart ache. I slept in her room again during my stay, and again, almost every morning, she would climb into bed with me and we’d have our “Here’s your Snuffy and here’s my Snuffy” conversation. Some mornings, though, we had much deeper conversations. “We see Baby John today and tell him to come home,” she informed me as she settled under my covers the morning after the baby was born. “Yes, we’ll go see him today.” It would be at least two more days before Mommy and Baby John could come home, but I decided we could cover that later. I started to drift back to sleep, listening to the rain on the window and feeling her breathing against me. But she was awake, playing with our Snuffy bears, and thinking. “Mommy’s at the doctor’s office with Baby Brudder and I can hold her and be nice,” she said. “Gentle,” she added, as she pulled stuffing out of the hole in my Snuffy’s belly. The day before had been long and exciting and stressful for her. She was eager and curious at first, wanting to hold the baby, wide-eyed with questions about the tubes and machines and bandages all over Mommy. 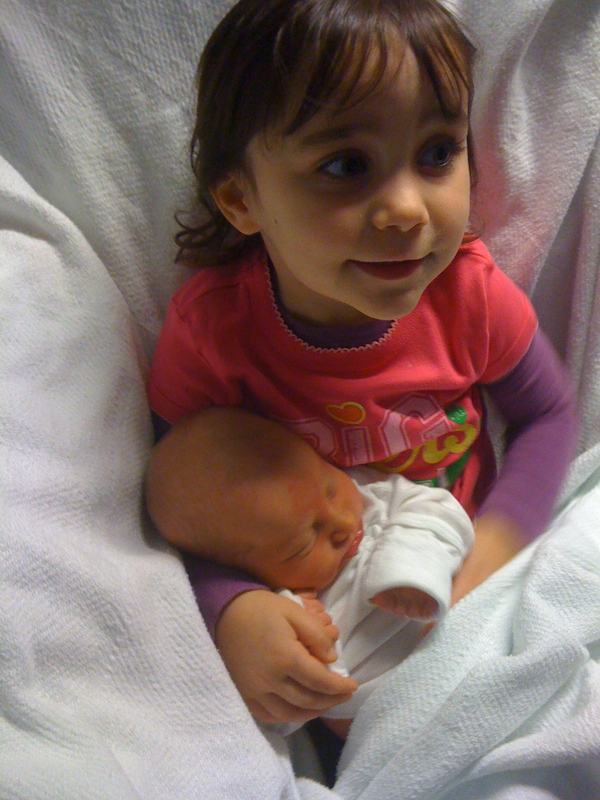 The first time she held the baby, Sophia listened solemnly to us, placing her hands and arms exactly where she was told. She looked up at us, as if to say, “Now what?” We smiled at her and took a hundred-thousand pictures. She kissed his fuzzy head. She counted his toes. She handed him back. Over the day, she asked often to hold him again, but each time we put him in her arms, she looked more and more sad. She was exhausted when I took her home, and she endured the familiar rituals of dinner, bath, and bed with a quiet intensity that worried me. Sophia was not buying it. “The doctor takes Baby John out of Mommy’s tummy and that hurts Mommy,” she insisted. Before I brought her to the “doctor’s office” that day, I found a florist so that she could bring Mommy flowers. The tiny shop was overflowing with glass and fragile gift-y things, all arranged within reach of an enthusiastic toddler. Even though I was nervous about how much the adventure would cost me, I was delighted to see her running around, counting balloons, pulling flowers out of pots, climbing display stands. She was her old self, a blur of fingers and giggles, naming things she recognized, issuing a litany of the familiar: blue flower, green frog (bibbit!! ), lellow futterbly, teapot like for Patti’s tea, pink kitty. I tried to keep her near the baskets of stuffed animals, where she could do the least damage, but that just resulted in a lot of empty baskets. And then, jumping up from the center of her pastel pile, Sophia held up a white bear with blue ears and a blue ribbon: “Baby John!” she shouted. I started to laugh and cry at the same time. I wanted to buy every white and blue bear in the place and help her carry them all to Baby John. I wanted to pick her up and squeeze her tight and never, ever let her go. The nights Sophia and I spent on our own, we would play for an hour or so, assembling her favorite puzzles over and over and over again, making up games: anything she wanted to play, we played. When it was time to eat dinner and then take a bath and then read stories for bed, her quiet intensity would return. She led me through her familiar routines, missing Mommy and Daddy, but not mentioning them. And then once I had closed the last book and adjusted her nightlight, she would start talking. She would go through the list of what she did understand (Mommy is at the doctor’s office with Baby John and Daddy is there too), circling and circling around what she did not understand (Mommy and Baby John come home now). She was sad, and she was confused, but she did not cry. She twisted her fingers into the fabric of my shirt, clutching. Never, Sophia, my peanut, my monkey, my little love, never. Your audience awaits – and the story about Sophia is very beautiful and very real and you can actually hear her little heart beating.